These are at the core of our business and control all of our activities.. The complete range of Chin Fong and Worcester Power Presses is designed specifically to meet the requirements of the customer. Utilising the latest computer-aided design techniques, we can produce presses which offer the optimum solution for a wide variety of applications. 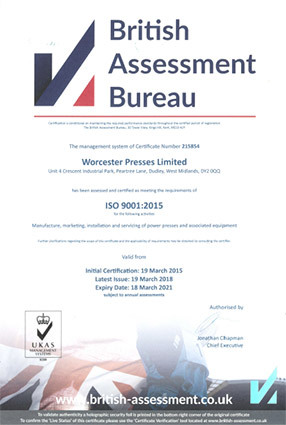 Both Chin Fong and Worcester Power Presses are manufactured to ISO 9001 quality standards. Built to the highest possible standards of accuracy and workmanship, our presses are cost effective and maximise production output levels, requiring only the minimum of routine maintenance to ensure a long and trouble free life.